As a child, I asked for these every year on my birthday. First my Yiayia made them for me and after she passed away, my dad took over and now I make them for my birthday guests. These are a bit of a special occasion desert but I will admit to making them once in a while on a random weeknight just because! 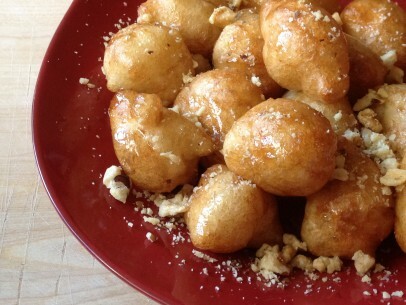 In Greece, loukoumades are more of a winter desert but you can find them around in summer if you ask. My family still teases me about the time I tucked away 5 softball sized loukoumades on one summer trip to Chios – I couldn’t help myself, they were that good. In the US, spring and summer Greek festivals always have them cooking up and the loukoumades are as big a draw as the bands. A handful of everyday ingredients – flour, sugar, yeast and water – are all you need to make up a batch of these lovelies. Let the batter rise for an hour or so and drop them by the spoonful into hot oil for a couple of minutes until they’re a gorgeous golden brown. Drizzle them with sweet syrup of honey (or agave) and sprinkle with chopped walnuts. That’s all there is to it! 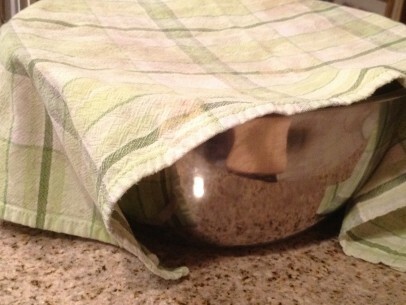 Add yeast to 1/2 cup of warm water, add teaspoon of sugar, stir gently and set aside to proof. 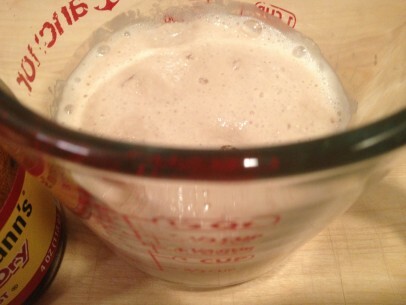 Make sure that the yeast/water becomes bubbly and foamy on top after a minute or two – this means your yeast has proofed. If it doesn’t, your yeast may be too old. If that’s the case, toss it out and try a new packet of yeast. 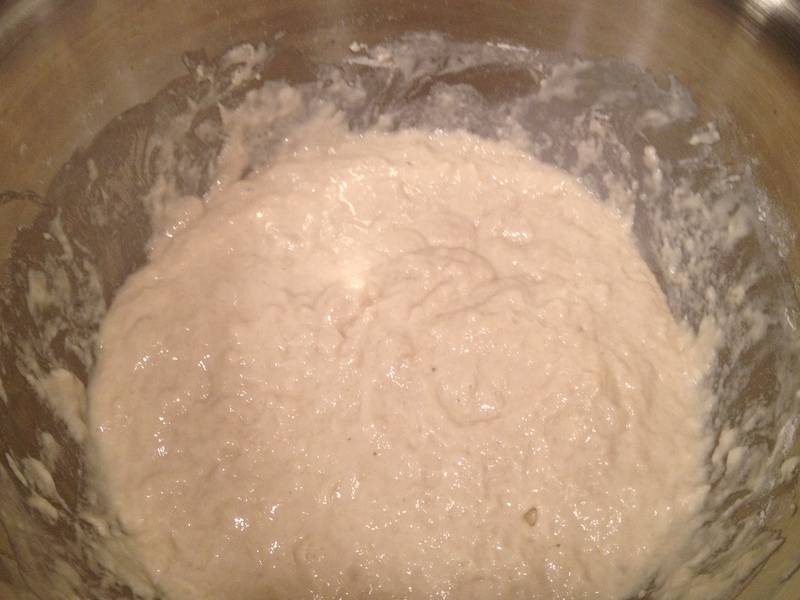 Don’t try to use the old, or unproofed, yeast – your batter won’t rise. 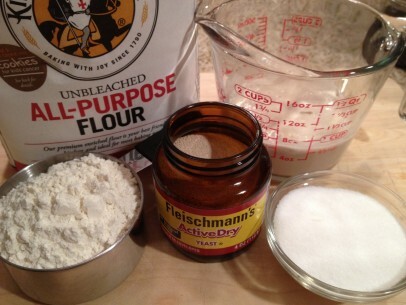 Combine the flour and sugar completely in large mixing bowl. 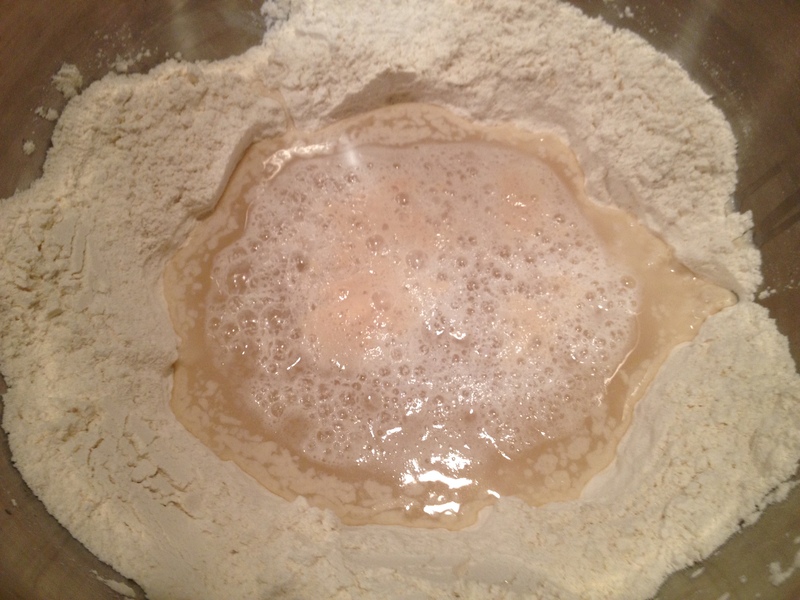 Scoop out a well in the center of the dry ingredients and add proofed yeast and 1 1/2 cups warm water. Stir well to combine all ingredients completely. The batter should be loose but thick and sticky. Cover bowl of batter with clean dish cloth and set aside in a warm place to rise. Batter should rise to about double its size in 1 1/2 to 2 hours. While batter is rising, combine honey or agave nectar, water, sugar and cinnamon together in saucepan and heat until you get a gentle simmer. Cook carefully for another 10 minutes and remove from heat. Set aside. 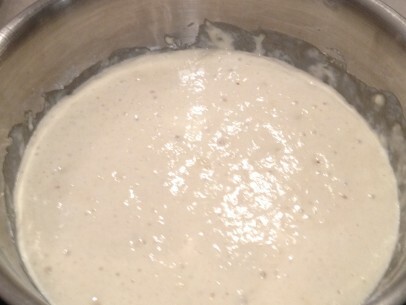 Risen batter should be soft and just about doubled in size with small bubbles on the surface. Stir dough gently to deflate batter. Add vegetable oil to medium sized pot. The oil should be at least 3 inches deep with 5 inches being ideal. Choice of pot/pan size is up to you, just keep in mind the at least 3-5 inches of oil rule. Heat oil to about 350 degrees. If you don’t have a thermometer, heat on medium low heat for about 3-4 minutes and test by adding a drop of batter to the oil. If it hisses and spits, your oil is hot enough and you’re ready to get started. I use the two-spoon method of scooping out the batter. My Yiayia used to just scoop up a handful of dough and squeeze it from her fist right into the oil. I’ve never perfected her method and every time I try it end up with more batter on me than in the pot so two-spoons it is. Keep a cup of warm water next to batter bowl to dip your spoons in between scoops. If you’re using an electric deep fryer, keep your temp set at 350. If you’re frying on a stovetop, move pot of oil off of the heat between batches to keep the oil from burning. 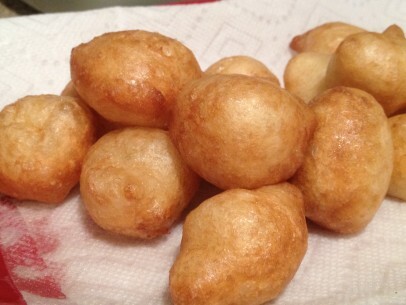 Drain loukoumades on a paper towel lined dish and serve warm with syrup. 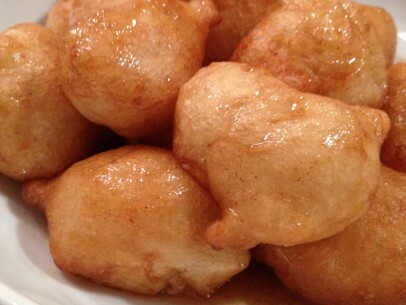 Make sure not to drench the loukoumades – too much syrup makes for soggy, heavy puffs. Lightly drizzle on syrup as you serve dish by dish. its best not to syrup the entire batch as the loukoumades at the bottom of the bowl will inevitably get soggy the longer they sit at the bottom of the bowl. Sprinkle with chopped walnuts. For a fun twist, use long wooden grilling skewers and alternate loukoumades and maraschino cherries – an extra festive way to enjoy this delicious desert! Is this a vegan version of a typically non-vegan recipe? Or are loukoumades usually vegan? I live in a primarily Greek neighborhood (Astoria, NY) and I’ve always been tempted to try these bad boys. They look so good! But I’ve been scared that they may have milk or eggs. Is that usually the case?… Like if I were to buy them from a Greek bakery or restaurant should I worry? The similarities between Lebanese and Greek cuisinecannot be denied. We have a similar recipe in Lebanon called Awamat! Your recipe sounds so good! 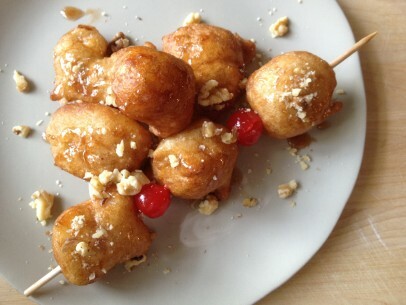 How many loukoumades would you say this recipe yields? Nick, I’d say 50-60 good sized loukoumades. Just waiting for the mix to rise now. This is a test run for next week at church the head Loukomades guy doesn’t want to show me how to make them so I’m on my own for our fundraiser. what church? it drives me crazy when people won’t share their recipes!!!! i will definitely try.. Thank you sharing loukomades recipe. Very thorough instructions and great tips! I will try these now esp during Lent. Thanks! I’ve made these a few times now and they’re great. Thanks for all your recipes! Honey is not vegan however my family is also from Chios and hey make their own syrup for Bakalhava so I will powder them up Italian tono or drizzle home made sugar syrup. Thank you. I am preparing for Easter and hope they are as well received as chocolate easter eggs. Can this recipe apply with gluten free flour?